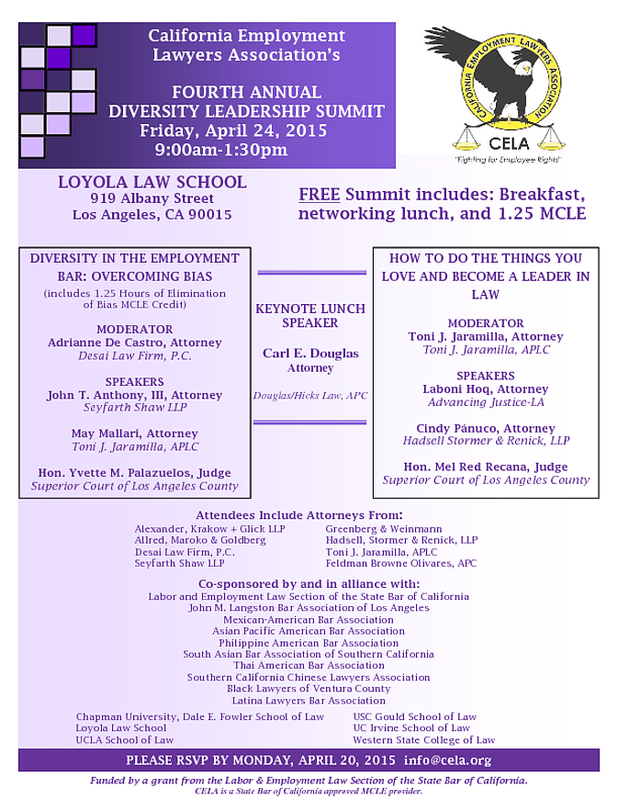 Please join TABA and the California Employment Lawyers Association at this year’s CELA Diversity Leadership Summit on Friday, April 24th, at Loyola Law School from 9am to 1:30pm. The Summit will include breakfast and a networking lunch. The event is free, and attendees will receive 1.25 hours MCLE credit. This year, the keynote speaker will be Carl Douglas. Other speakers include Judge Palazuelos, Judge Recana, Laboni Hoq, John T. Anthony, May Mallari, and Cindy Pánuco. The two panels will be moderated by Toni Jaramilla and Adrianne De Castro. Please RSVP to info@cela.org by Monday, April 20. Hope you all can attend!